Suddenly, RSS which was becoming moribund and seen to be out of tune with the times, is growing. 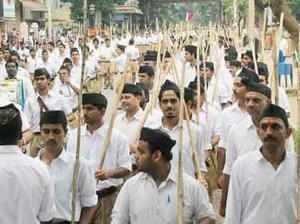 LUCKNOW: For the last three months, Ravi Tewari, a 22-year-old engineering student, has been waking up at 5am, putting on his white shirt and khaki shorts and rushing to a nearby park for the morning shakha of Rashtriya Swayamsevak Sangh (RSS). His family is surprised. No one in the Tewari clan has ever been with RSS. So, the family can’t quite figure what is driving Ravi to adopt this punishing morning drill. Ravi speaks with a sense of purpose that only a new convert can have. He had never dabbled in politics before he joined ABVP, BJP’s student wing, a few months ago. And there are thousands like him, he says, neo-converts who have breathed new life into RSS after Modi was named the BJP’s PM candidate on September 13 last year. “More and more young people are coming forward and joining shakhas,” says Atul Singh, who heads a newly established shakha in Lucknow. What do the shakhas do? “They focus on character building, idealism, discipline and, of course, Hindutva. We are creating awareness among people to vote for a ‘suitable’ political candidate,” he said; ‘suitable’ of course being shorthand for Modi. Ashok Sinha of the RSS’ publicity wing says the Lok Sabha elections are like a national festival for the Sangh. “Our activities increase during elections but this doesn’t mean we do not work at other times. Shakhas focus on personality development and social inclusiveness and what better than the involvement of young,” he says.